For Kog, meeting our first Estelon (the XA) was one of those love-at-first-sight moments. Fortunately, the sound lived up to the stunning look, and over the years our appreciation has never waned. In the Estelon X Series loudspeakers, the user can find a melding of both aesthetic beauty and performance into one. Their shape - the E-lon cabinet - allows for ease of integration of the speaker into a room; beautiful like sculptures, but at the same time totally 'invisible' when listening to the music. The mighty Extreme model followed later, to give audiophiles looking for the ultimate in both sound and aesthetics something to satisfy their desires, and the entry level YB debuted to great success in 2017, thus bringing the Estelon brand to more users than ever before. Estelon - a continuous pursuit of absolute perfection by mixing science and art. High-End loudspeakers where aesthetics are driven by functionality and innovation, whilst never forgetting the emotion. Handmade in Estonia by Alfred & Partners OÜ. 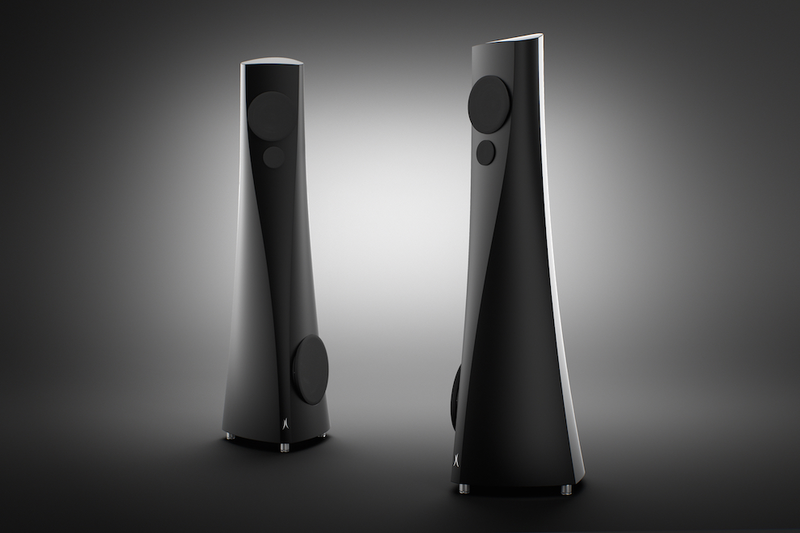 Summer 2014 saw the debut of the revolutionary new flagship loudspeaker from Estelon. Building on the design credentials of the X series, the Extreme incorporates the very latest technology and unique features, all designed to achieve state-of -the-art performance. This monumental sculpture of a speaker, standing up to 2 meters high, craves for attention through Estelon’s signature design. Extreme gives you a perception of the quality it performs, even before you embrace the entrancing sound it delivers. The proprietary marble based composite material with the finest aesthetic finish presents the familiar sculpture-like design that Estelon has trademarked over the years. Following the principles that have proven itself with every product launched by Estelon, the shape and the material of the speaker are an essential part of the powerful performance the speaker provides. The truly mesmerizing experience begins when the design and the technology fuse together, as the audience will be left in awe after being absorbed in seamlessly blended soundscape. Every aspect of Extreme’s sound is rich, dynamic and immersive. All the details are delivered with perfection, providing the listener with a truly natural and pure experience. The sound of Extreme is an event on its own, where the speaker itself completely disappears as a sound source, replacing its presence with the venue in which the recording was made. The Extreme features adjustability to allow tailoring to room dimensions and seating position, whilst maintaining perfect phase alignment across the full audio bandwidth. Has perfection been attained? 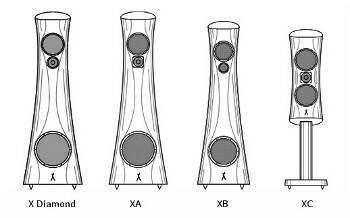 The X Diamond is far more than simply speaker drivers in a cabinet. It is a genuine musical instrument in its own right. One that, when carefully integrated into system and room, is capable of connecting the listener to music in a most profound way. Everything expressed naturally and simply with balance, order and measure. It possessed an eminently musical temperament that is immediately evident upon your first and each subsequent listening experience. The Estelon XA is both Alfred Vassilkov’s first tribute to the Estelon brand and the birth of a new approach to loudspeaker design. Chief among the physical design elements is the use of the E-lon cabinet form, having been developed and honed over a five year period; its design and construction allow it to easily couple with even difficult room acoustics. With the XA, the most beloved element of Estelon products has been reaffirmed: Simplicity. The “minimal” electrical second order crossovers, the raffinated mix of other elements as drivers and acoustic enclosure, has allowed Estelon to find again, trusted and confirmed qualities, a rediscovering and refinement of old but never obsolete design principles, technological principals that are the true expression of Estelon’s sonic aesthetics. The Model XB is much awaited addition to the Estelon X-Series. Sharing the similar E-lon shape with XA and X Diamond, it is a smaller speaker designed for smaller listening rooms (suggested room size 20-50 m2) while keeping the hallmark of Estelon loudspeakers – the exceptionally wide imaging, deep sound staging and thrilling life like dynamics. The Model XB will surprise a listener with very defined and unexpectedly deep bass, clear and articulate mid and extremely good dynamics in high frequencies. The Model XB is capable of reproducing the finest nuances of music. Inspired by the development of the Estelon XA, the Estelon XC offers much of the XA’s qualities in a smaller and less expensive full range monitor. Exceptionally wide imaging, deep sound staging and thrilling life like dynamics are a hallmark of Estelon loudspeakers and the XC is no exception. By combining these legendary sonic attributes with a musically detailed presentation, Estelon has again redefined the standard reference in a small speaker design. Cosmetically, like its full-sized, floor-standing brother, the diminutive XC features the same seductively shaped E-lon cabinet and multi coated lacquer finish. When high-resolution performance is required, the Estelon XC is the ideal choice for listening rooms where the larger Estelon XA would be impractical or excessive. The Model YB is yet another unrivalled sonic masterpiece from Estelon; delivering the finest sound and placing the listeners at the heart of the audio landscape. The asymmetrically designed speakers are a true marvel of sophisticated engineering providing a profound and unparalleled experience in the most exquisite venues. The 8-inch woofer with an extremely stiff aluminium cone, gives tremendous bass precision delivering deep natural bass while a 5.25-inch mid-woofer, known for its sliced paper cone technology where the slices are filled with damping glue, dramatically reduces breakup modes in the diaphragm. Finally, the beryllium membrane 1-inch tweeter characterised by its extreme rigidity, light weight and high damping, allows for negligible distortion and distinct clarity, delivering incredibly powerful sound. For Estelon, the new brand, the visionary development started in 2006 when Alfred Vassilkov started to analyze materials and technologies for producing cabinets with streamlined shapes that could not only reproduce the best sound but also assimilate into an interior, with their elegant “sculpture” look. Years of work had led him to a proprietary, crushed marble based composite. The material having excellent stiffness and damping factors, as well as technical features that allowed for the creation of cabinets with a design that enhances the sound reproduction capability of the system as a whole. The special E-lon shape of the loudspeaker creates ideal conditions for sound reproduction. Its rounded form excludes corner reflections. A narrowing of the tweeter area - the front panel sculpted - to achieve zero-phase at the listening point, while its larger radii maintain their excellent influences on the direction diagram. The cabinet becomes wider and deeper at its base for both stability and to allow for the volume required for effective low frequency reproduction. Finally, every loudspeaker produced must pass Alfred & Partners extreme level of quality control - each pair of loudspeakers is assembled, tuned and then listened to individually. And lastly, all the products are handmade in Estonia, to their exacting standards. There can be few world-class firms that have been founded at the breakfast table, but Estelon – from Tallinn, Estonia – is certainly one of them. The high-end audio brand traces its origins back many decades when a young boy obsessed with music, began to take apart radios and adjust them to improve the sound quality. This was the beginning of a journey that led to an important moment back in 2010, when engineer Alfred Vassilkov was sitting down with his family. Alfred had been designing speakers for other companies for over 25 years and spent many years researching opportunities to achieve his ambition. His early interest in improving sound equipment led him to university, studying electro-acoustics in St Petersburg. These experiences enabled Alfred to develop technologies and find materials with which to construct unique and innovative products. These were combined with inspiration from nature – particularly from the lush and expansive forest landscapes of Estonia – to create the perfect balance between engineering and design. The result was Estelon, one of the world’s most luxurious speaker brands. It derives aesthetic and acoustic excellence through the merger of ingenious creativity and cutting-edge science. Each decision – from engineering techniques to materials and components used in the manufacturing process – is made with the perfect harmony of the speakers as a whole in mind. Alfred & Partners, the Tallinn based design studio and think tank, is not simply a business but a dedication, a dedication to a single, heartfelt idea - the production of Instruments, Sound Diffusers, Sculptures - capable of unveiling the rich, emotional tapestry of music in a personally involving way. 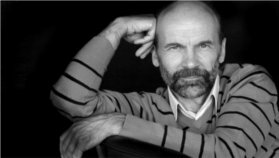 For more than 25 years, the designer and founder, Alfred Vassilkov, has been designing loudspeakers - achieving success both in design and patents - with developed products, in Europe. A decision was made - that to establish his own brand based on his gathered experience and knowledge. Such dedication carries with it the implicit responsibility of a wholly uncompromising approach to audio design. Pride of craftsmanship shares equal footing with sonic innovation. Their visionary achievements, their quest for musical truth, continuously pushing the envelope - the result is a product line that offers unrivaled musical revelation packaged in designs of unparalleled beauty. More importantly, we hope that their efforts can, in some small way, offer a key that assists listeners in unlocking the vast structure of emotion that is music."